75 percent of Baby Boomers feel like they have enough money to live comfortably during retirement and only 35 percent of Gen X’ers feel like they’ll be able to live comfortably during retirement. Pensions and 401(k)s are king for Baby Boomers while 401(k)s and IRAs are the two most popular ways Gen X’ers are saving for retirement today. 73 percent of Baby Boomers currently rely on Social Security as a portion (25 to 100 percent) of their monthly income, however, 85 percent of Gen X’ers are expecting to rely on Social Security for at least 25 to 100 percent of their monthly income. Just over 50 percent of Baby Boomers and Gen X’ers saved or will have saved $700,000 or less. Retirees (Baby Boomers) feel that’s enough while those planning for retirement (Gen X’ers) don’t. More females are saving for retirement. Baby Boomers who saved were around 65 percent male and 35 percent female. Gen X’ers who are saving are close to 50 percent male and female. Top three things Baby Boomers wish they would’ve done differently: investing differently or played the stock market better, reduced spending or lived on a budget, invested more in a Roth IRA as opposed to a traditional IRA. For those not saving for retirement, stagnant wages, student loan debt and the cost of living were the top reasons given for why they aren’t able to save for retirement. You’ve probably seen the headlines by now. One in three Americans have nothing saved for retirement and just over 50 percent only have $10,000 put away for their golden years. We wanted to find out how our readers – retired or soon-to-be retired – have financially prepared or are financially preparing for their own retirement. We asked around 600 people ages 40 to 80+ two sets of questions depending on whether they are currently retired (Baby Boomers) or soon-to-be retired (Generation X), then analyzed and compared the results. Of the number of respondents, about 350 are currently retired and about 220 are not. We wanted to see how those who are currently retired feel about their financial situation and compare it with those who are currently saving (or not) for retirement. As you read the analysis, keep in mind, “retirees” or “Baby Boomers” refers to those born between 1940-1960 and those “planning for retirement” or “Generation X” refers to people born between 1960 and 1980. Each age group had a few outliers being born a little bit before or a little bit after the age groups. If you’re still in the retirement planning phase, be sure to check out our retirement planning resources. 1. 75 percent of Baby Boomers feel like they have enough money for retirement compared with only 35 percent of Gen X’ers. We asked Baby Boomers if they felt like they have enough money to live comfortably during retirement and 75 percent said they do. 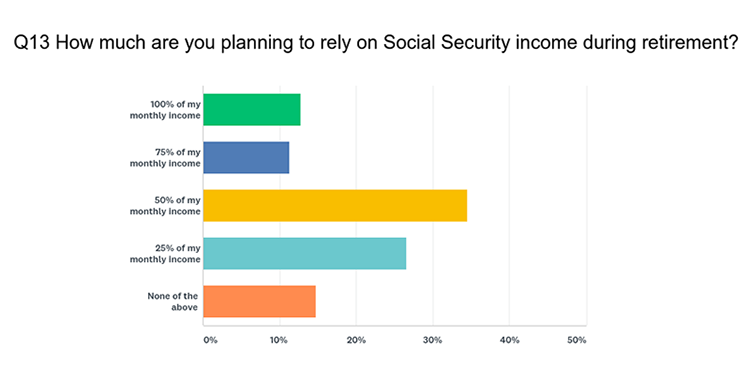 When we asked Gen X respondents if they felt like they will have enough money to live comfortably during retirement, only 35 percent said yes and about 22 percent said yes as long as they have Social Security income each month. 75 percent of Baby Boomers feel like they have enough money to live comfortably and only 35 percent of Gen X’ers feel like they’ll be able to live comfortably during retirement. 1a. 86 percent of people who aren’t retired yet are saving for retirement. Of the 14 percent who aren’t, we asked them why not. Overwhelmingly people said they only have enough money to make ends meet day-to-day. Stagnant wages, student loan debt and the cost of living were the top reasons given for why they aren’t able to save for retirement. 2. Pensions and 401(k)s are king for Baby Boomers while 401(k)s and IRAs are popular with Gen X’ers. 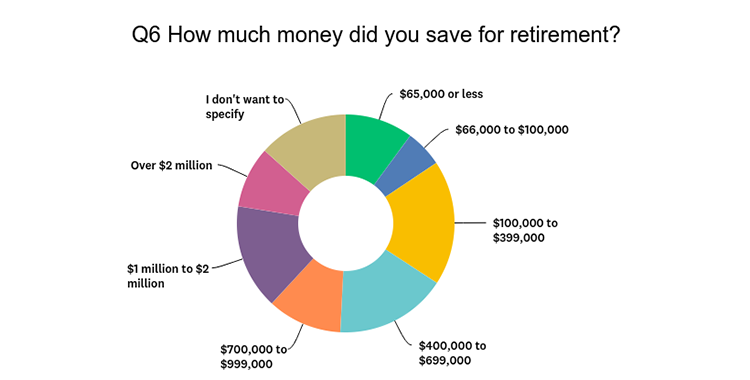 We asked Baby Boomers how they saved for retirement. 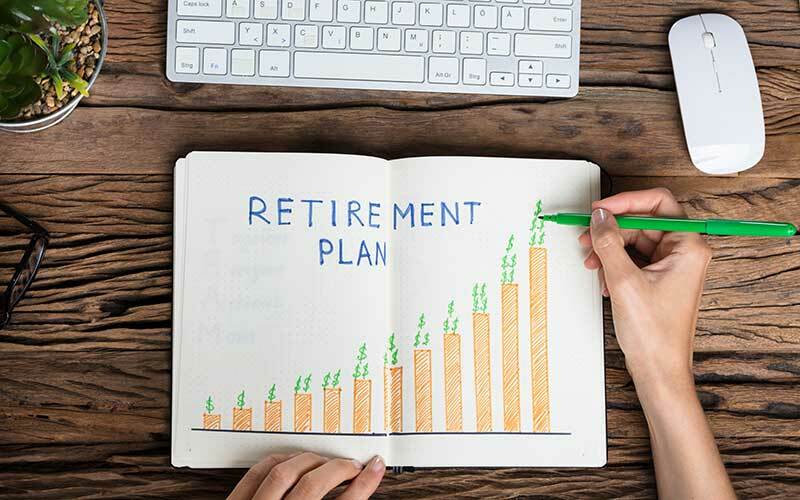 While they diversified fairly well, nearly 65 percent rely on their pension, followed by 62 percent who rely on a 401(k), Roth 401(k) or 403(b) and about 47 percent rely on an IRA (Roth, SEP, Simple or Traditional). About 36 percent of Baby Boomers invested in stocks and/or bonds and around 32 percent saved money on their own using a traditional savings account in addition to investing. Annuities, Thrift Savings Plans (TSP), Inheritance and Gold Investments (Gold IRA), rounded out the other methods of saving. 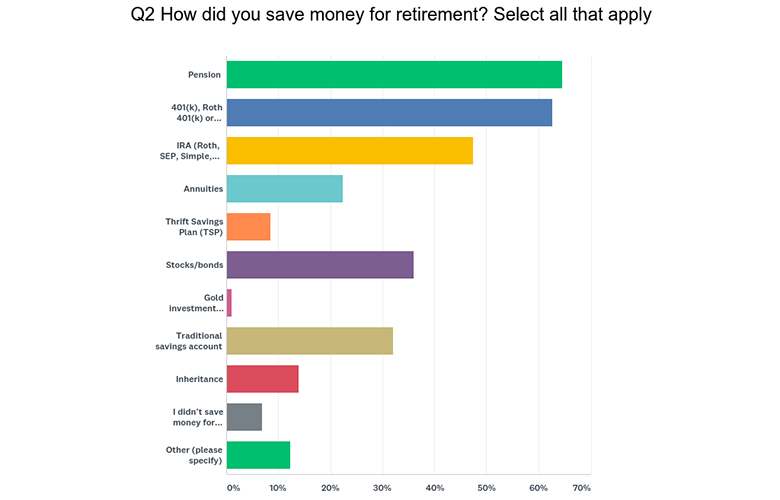 It’s interesting to note when asked if they used any other method of saving for retirement, the majority said they also bought/sold or invested in real estate. 2a. To compare we asked Gen X’ers how they’re saving money for retirement. Nearly 70 percent are using some form of 401(k), followed by some form of IRA (40 percent). Almost non-existent today, Pensions are being relied on less, although about 38 percent of Gen X’ers are using them to save for retirement. Traditional savings accounts (30 percent) and stocks/bonds (26 percent) are also being used a fair amount. When asked about other ways they are saving for retirement, real estate investments were the popular choice among Gen X’ers as well. 3. 73 percent of Baby Boomers currently rely on Social Security while 85 percent of Gen X’ers are expecting to. We faithfully contribute to it each paycheck hoping it will one day be there for us when we need it, but how much do people actually rely on Social Security as part of their monthly income during retirement? According to our survey results, only about nine percent of retirees currently fully rely on Social Security as part of their monthly income. About 56 percent of retirees rely on it for a quarter of their monthly income or not at all. 73 percent of Baby Boomers currently rely on Social Security as a portion of their monthly income, while 85 percent of Gen X’ers are expecting to rely on Social Security for a portion of their monthly income. 3a. Conversely, when we asked how much Gen X’ers are planning to rely on Social Security as part of their monthly income during retirement, they expect to dip into their Social Security a bit more. Nearly 13 percent plan to fully rely on Social Security for their monthly income, while around 60 percent expect it to cover 25 to 50 percent of their monthly income. 4. $700,000 (or less) is the target goal for respondents. Baby Boomers feel that’s enough while most Gen X’ers don’t. It’s a tough question to get an exact or satisfying answer: how much do I need to retire? We mentioned earlier 75 percent of retirees felt like they have enough money to be comfortable during their golden years. It turns out, that number is $700,000 or less for our retired respondents with just over 50 percent saying they saved that amount for retirement. Only about 36 percent of retirees said they saved anywhere from $700,000 to over $2 million. A little over 13 percent declined to specify. Just over 50 percent of Baby Boomers and Gen X’ers saved or will have saved $700,000 or less. Baby Boomers feel that’s enough while most Gen X’ers don’t. 4a. It is interesting to see similar figures for Gen X’ers currently planning for retirement. Just over 50 percent expect to have $700,000 or less saved by the time they retire with close to 40 percent saying they expect to have anywhere between $700,000 and over $2 million. Eight percent of respondents declined to specify an amount. While there doesn’t seem to be much change in the amount people have saved and the amount people expect to save, it seems that people are starting to feel unsure if they’ll be able to lead a comfortable life once they retire just from living on their savings. As we saw, More Gen X’ers hope to rely on Social Security for help on top of their savings. 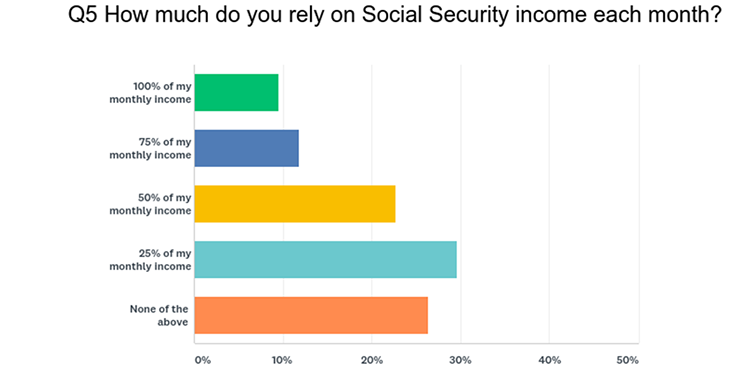 If we compare what experts say you should have saved by the time you reach full retirement age (67), where you can draw Social Security, with what our respondents saved or are planning to save, the majority of our respondents fall short. According to The Motley Fool, nearly four out of 10 people think you need $1 million saved for retirement and in 13 states in the U.S., $1 million would last 20 years or less. Of course, it’s important to note how much you should save for retirement depends on your age, when you start saving and what your financial goals are. Most of our Baby Boomer respondents seem to be doing fine with $700,000 or less. Below is the breakdown of what each group has saved or plans to save. 5. Nearly 50 percent of Baby Boomers wished they would’ve started saving for retirement earlier. We wanted to find out if the Baby Boomers in our sample had any advice for those who are currently saving for retirement. 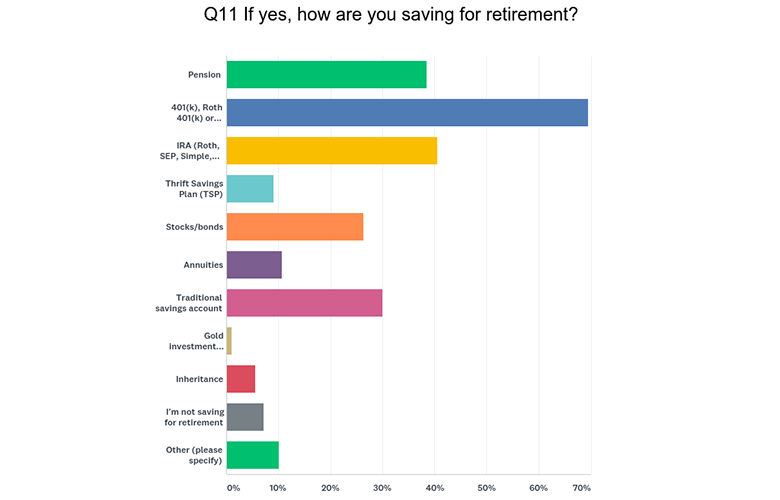 When we asked them if there was anything they wished they would have done differently when it came to planning for retirement, almost half said they wish they would’ve started saving earlier – echoing most financial expert’s warnings. While Gen X’ers plan on saving around the same amount for retirement as Baby Boomers did, most of them don’t know if it will be enough as opposed to the Baby Boomers we surveyed who say they feel like they have enough money to live comfortably during retirement. 50 percent of Baby Boomers saved $700,000 or less and say they have enough to live comfortably during retirement. 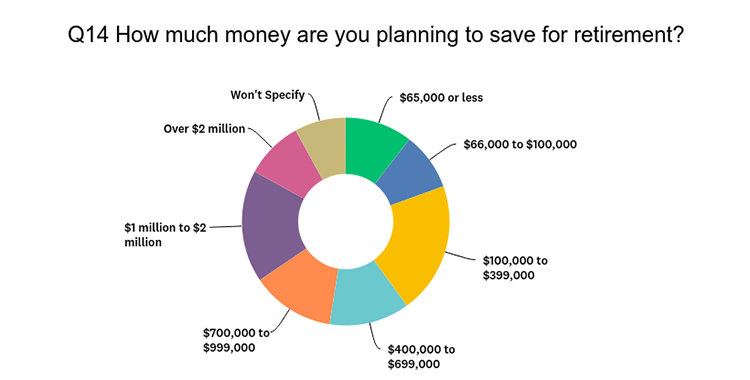 Around 52 percent of Gen X’ers plan on saving $700,000 or less but most say the aren’t sure if that will be enough. Baby Boomers are relying on their Pensions and their 401(k)s the most while Gen X’ers are putting the majority of their retirement savings in 401(k)s, IRAs and traditional savings accounts. Gen X’ers are hoping to rely on Social Security more than their predecessors. Around 85 percent of those born between 1950 and 1980 hope to use Social Security as 25 to 100 percent of their monthly income. Only 73 percent of Baby Boomers currently rely on Social Security during retirement. When it comes to things they wished they’d done differently, the majority of Baby Boomers mentioned three things: investing differently or played the stock market better, reduced spending or lived on a budget, invested more in a Roth IRA as opposed to a traditional IRA. Retirement Living wanted to find out how Baby Boomers – those born between 1930 and 1960 who are currently retired – feel about their financial situation regarding how they saved for retirement, how much they saved, if they feel like they have enough money saved for retirement and if there was anything they wished they would’ve done differently. Next, we wanted to find out how Generation X – those born between 1960 and 1980 who are close to retirement age and are currently saving for retirement – feel about their financial situation regarding how they’re saving for retirement, how much they plan on saving for retirement and if they feel like they’ll have enough money for retirement. We then compared the two sets of results to see how Gen X’ers retirement savings plans are measuring up to how Baby Boomers faired. To do this, we surveyed close to 600 people (n = 562) using two sets of multiple choice and fill-in-the-blank questions, based on whether the respondent was currently retired or yet to retire.